’ The answer was that your ad was published, your commercial ran, your online impression served on a web page, but it was impossible to say with certainty whether an ad was viewed or not. Thanks to leaps forward in digital technology and the hard work of many in the industry, it's now possible to measure whether an ad is viewable onscreen. Given this progress, it's not a matter of if this becomes the standard, but when. We support a viewable impressions standard and have been partnering with the industry to push this forward. Today we've reached an important milestone on this journey - Media Rating Council (MRC) accreditation for our viewability measurement solution, Active View, which we introduced last year. "We are very pleased that Google has achieved accreditation for its Active View product" said George Ivie, CEO and Executive Director of the Media Rating Council. "Viewable impressions are an important foundational improvement in digital measurement and an important step toward comparability with other electronic media." Active View complements our other investments in making digital an effective medium for brand marketers and their awareness-building campaigns, like Lightbox ads and TrueView in AdMob and games. These efforts appear to be paying off for brand advertisers: we saw a 65 percent increase last quarter alone in the number of brand advertisers using our brand formats and buying tools. Viewability has the power to transform the industry: improving the value of marketers’ spend, and of publishers’ sites. We’ve also designed this metric to be actionable, not just for after-the-fact reporting. Based on Active View, advertisers can buy reservable inventory on the Google Display Network (GDN), paying only for impressions that meet the Interactive Advertising Bureau’s proposed viewability standard - at least 50% on screen for one second or longer. Effective metrics also serve as a universal currency, building an understanding between marketers and content creators about the best way to reach an audience, and the value of an ad on a page. This is why we’ll be building Active View into our products both for advertisers and publishers. In addition to its use on the GDN, Active View reporting will be available in DoubleClick for Advertisers and DoubleClick for Publishers in 2013. Long term, we see this becoming the new standard for how impressions are bought, sold and measured, replacing the “served impressions” metric we have today. 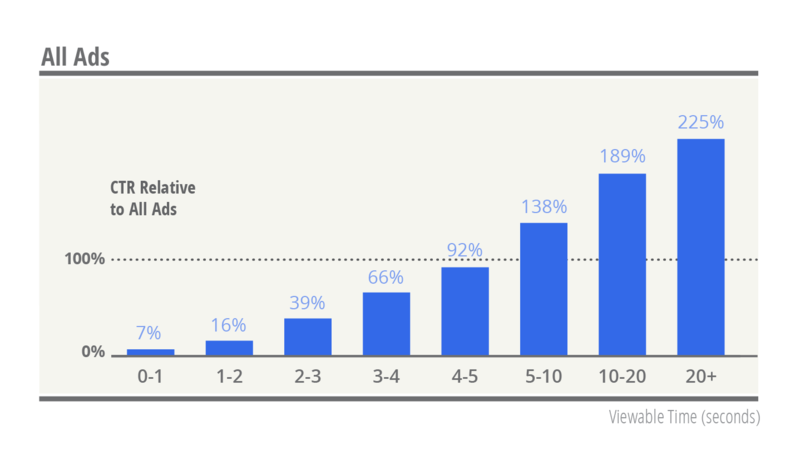 Users are more likely to click on viewable ads -- up to 21 times more. Viewability can help publishers discover “gold below the fold,” with CTR doubling, on average, for below-the-fold inventory. On average, we’ve found that CTR is comparable for viewable above-the-fold and viewable below-the-fold inventory. The longer users view an ad, the bigger the boost for click-through rates (we saw up to a 125% increase when an ad was viewed for more than 20 seconds). Figure 1. 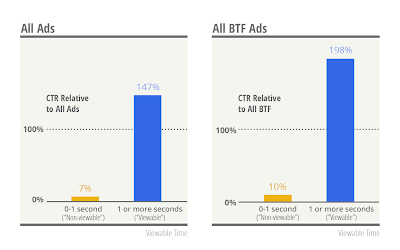 Comparison of CTR for viewable v. non-viewable ads, shown for all ads (left panel) and BTF inventory only (right panel) (100% = the average CTR of the specified dataset). Figure 2. CTR by viewable time, detail. *Data source for all figures: Google Display Network 2% sample from February 2013; display ads only; viewable = 50% onscreen. In all figures, 100% on the y-axis denotes the average CTR across all ad queries in the specified dataset. Google’s MRC accreditation, which currently applies to the Google Display Network and DoubleClick for Advertisers, was based on a thorough assessment of a number of factors, including the detection process, quality control and delivery standards. With this accreditation, we are one step closer to making a viewable standard a reality for our partners. With better measurement, we think it's possible to unlock a new golden age of creation across the web, where users can enjoy great content, brands can connect with their customers and content creators can accelerate their growth. Brand marketers since the “Mad Men” era have often sought insight to a simple question: ‘Was my ad seen?’ The answer was that your ad was published, your commercial ran, your online impression served on a web page, but it was impossible to say with certainty whether an ad was viewed or not. Thanks to leaps forward in digital technology and the hard work of many in the industry, it's now possible to measure whether an ad is viewable onscreen. Given this progress, it's not a matter of if this becomes the standard, but when. New Placement Performance Reports combine automatic and managed placements in one report, so you can see quickly how your ads perform on different websites and adjust your targeting and bidding accordingly and with ease. These new reports will be available globally in the next few weeks in the Display Network Tab. The beauty of digital is real-time information and real-time action. We hope these new features will give you more insights, better ways to act on them, and an easier and more efficient way for you to buy display ads. Great ad campaigns have always required two things: knowing your audience, and using that knowledge to reach them in smart ways. Today we're thrilled to announce new innovations that will help display advertisers with both parts of that equation. They are the Google Display Planner and two new reports: Demographic Performance and Placement Performance. Find new inventory. Display Planner finds and suggests thousands of websites, mobile applications and video channels for your ads across the online world. Generate targeting ideas. Are you trying to reach golfers, or new parents? Just describe their interests, websites you know they visit and products they buy. 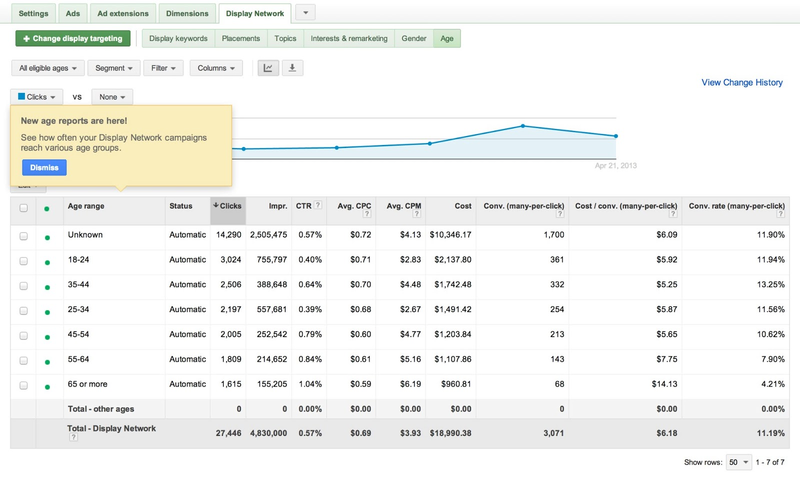 Display Planner will use that data to suggest good keywords and other targeting ideas. Turn data into insights. What is the total opportunity for your Google Display Network campaign and what can you expect in return? Display Planner tells you, with estimates and historical data to back it up. Display Planner is part of AdWords, so with one click you can add your plan directly to your account, or download to share it. Display Planner will be available in the Tools & Analysis menu, and will be rolling out to the US over the course of this week, and globally in the next few weeks. You can learn more in our Help Center. Now for the other half of the equation: knowing your audience. Our two new reports will help you understand how your ads perform across different customer segments and websites. Demographic Performance Reports show how different demographic segments, gender and age buckets, respond to your messages by showing the impression, click and conversion rates for each group - a marketer's dream! Armed with these new insights you can quickly tailor your ads to be more relevant for your audience, and modify your targeting and bidding settings for better performing campaigns. and Attribution Modeling. Tens of thousands of our largest advertisers are gaining valuable insights from Multi-Channel Funnels every month, and we’ve collected these insights using aggregate statistics to develop a benchmarking tool — The Customer Journey to Online Purchase. This interactive tool lets you explore typical online buying behavior and see how different marketing interactions affect business success. The tool draws on Ecommerce and Multi-Channel Funnels data from over 36,000 Google Analytics clients that authorized sharing, including millions of purchases across 11 industries in 7 countries. 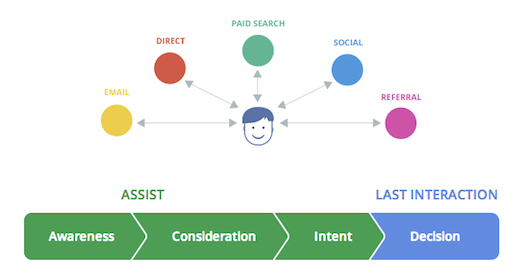 Purchase paths in this tool are each based on interactions with a single ecommerce advertiser. how different marketing channels (such as display, search, email, and your own website) help move users towards purchases. For example, some marketing channels play an “assist” role during the earlier stages of the marketing funnel, whereas some play a “last interaction” role just before a sale. how long it takes for customers to make a purchase online (from the first time they interact with your marketing to the moment they actually buy something), and how the length of this journey affects average order values. The data shows that every industry is different — the path to purchase for hotel rooms in Japan is not necessarily the same as the path as for an online supermarket in Canada. As you might expect, customers typically click on display ads early in their purchase journeys, but in some industries, such as US travel and auto, display clicks tend to occur closer to the purchase decision. Across industries and countries, paid search has a fairly even assist-to-last interaction ratio, implying that this channel can act both in the earlier and later stages of the customer journey. Once you’ve explored the benchmarks, look deeper into your own marketing data with the Multi-Channel Funnel reports, and consider defining your channels and campaigns to separate out categories that are specific to your business needs. We also see interesting patterns emerge when examining the length of the customer journey. While the majority of purchases take place within a single day or a single step (i.e., a single interaction with one marketing channel), longer paths tend to correlate with higher average order values. in US Tech, online purchases that take more than 28 days are worth about 3.5 times more than purchases that occur immediately. And while 61% of tech purchases take place on that first day, only 53% of revenue comes from single-day purchases. in Consumer Packaged Goods (CPG), on the other hand, most purchases (82%) are quick, likely because these are smaller and simpler purchases that don’t require much research. in Edu / Gov, 41% of revenue comes from multi-day purchases, but 60% of revenue comes from multi-step purchases — suggesting that even when customers make decisions in a relatively short time period, they often have multiple marketing interactions before purchasing. For marketers, it’s always a crucial challenge to design campaigns that deliver the right message at the right moment in a customer’s journey to purchase. We hope these benchmarks will provide useful insights about the journey and help you put your business into context. In particular, take a look at the final infographic, the “Benchmarks Dashboard,” to get a quick overview of your industry. 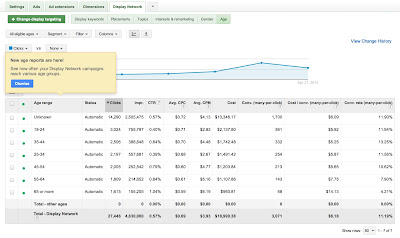 Then, when you view your own data in the Multi-Channel Funnels reports in Google Analytics, you’ll gain a better understanding of where different channels impact your conversions and what your typical path looks like, so you can adjust your budgeting and marketing programs accordingly. Try The Customer Journey to Online Purchase today on Google’s new Think Insights website. Savvy marketers understand that you don’t always seal the deal with a single message, image, or advertisement. A user may see a display ad, click on a link from a friend, or do a search before buying something from your website — and all of these interactions can play a role in the final sale. It’s important to understand the entire customer journey so you can measure all of the elements that contribute to your campaigns, attribute the right value to them, and adjust your marketing budgets where appropriate. That’s the philosophy behind Google Analytics tools like Multi-Channel Funnels and Attribution Modeling. Tens of thousands of our largest advertisers are gaining valuable insights from Multi-Channel Funnels every month, and we’ve collected these insights using aggregate statistics to develop a benchmarking tool — The Customer Journey to Online Purchase. This interactive tool lets you explore typical online buying behavior and see how different marketing interactions affect business success.